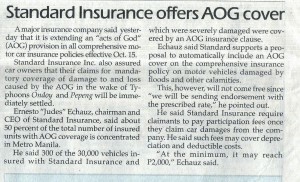 Standard Insurance Advisory on Force Majeur or AOG for vehicles. After the Ondoy and Pepeng typhoons, a lot of articles have been posted regarding Force Majeur or Acts of God as a guide for the victims. Car Dealerships and 3 star motor shops are now also flooded with customers which is good for their industry. The leading motor car insurance company, Standard Insurance Co.,Inc have been very active lately with their marketing campaign in line of providing fair service to their assured. 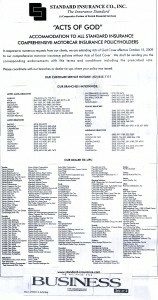 Last Monday, they posted an Ad with Philippine Star that highlighted their branches and dealer tie ups for reference. They also mentioned that they are also accepting Act of God Coverage starting October 15, 2009 which was suspended temporarily after the typhoon to give way for the immediate processing of claims “with” Force Majeur coverage at the moment. paid ads by standard insurance. 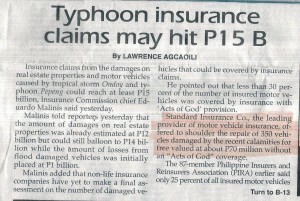 However, last Thursday, October 22, 2009, an article in Philippine Star made a confusion to a lot of their assured customers both with AOG and without. It really gave a lot of confusion to the general public, even me. I really felt bad for my clients who were affected by the typhoon without the Acts of God rider, after knowing of this false article from a text, i immediately texted some of my clients and informed them of the good news, not knowing it was a false one! This is the article on the today's Philippine Star, October 23, 2009 that will clarify the false article from yesterday. I hope this blog will help everyone with problems with ACTS of GOD.